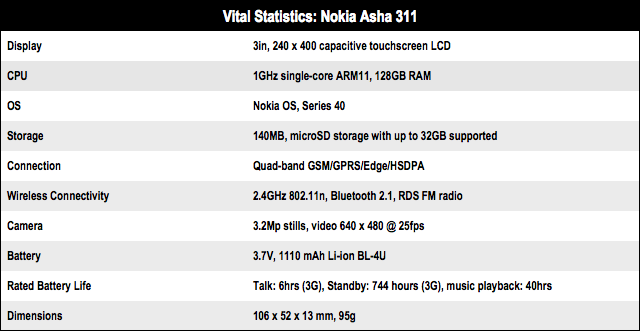 Nokia’s smartphone sales may be in the toilet at the moment but it still flogs a fair number of handsets under the Asha brand of feature phones. Newest to the ranks is the Asha 311 which looks and behaves a bit like a smartphone but has a far lower purchase price – around £100 unlocked and SIM-free. 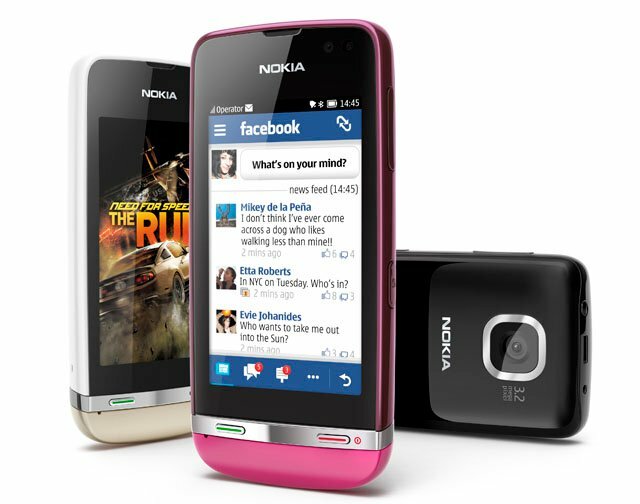 For your cash you get a handset with a 3in 240 x 400 capacitive touchscreen, quad-band HSDPA, 802.11n Wi-Fi, a 1GHz CPU and a 1,110mAh battery. You also get one that’s impressively small, light and well made – say what you will about Nokia, but it still knows how to design and build an affordable phone that doesn’t feel like tat. At this price point though, the Asha 311 is entirely plastic but it’s still a solid and handsome device. At the top it sports a 3.5mm audio socket along with microUSB and 2mm power connectors – you can charge through either. Over on the right are the volume and on/off buttons. Below the screen sit solid physical call answer/end buttons while the Sim and microSD cards are buried under the battery. The 3in 155dpi screen is clearly no match for the new 720p Android or Apple retina displays but it’s a higher density figure than the iPad2 or any current 1280 x 800 10in Android tablet, so don’t be too dismissive. It certainly proved crisp, bright and colourful enough to keep me happy. 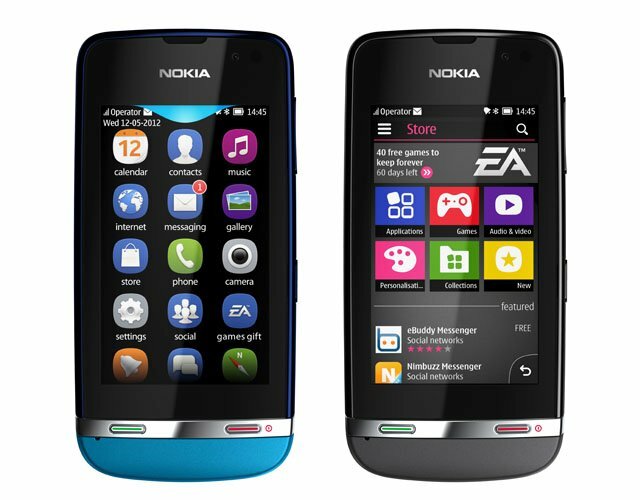 Albeit touting an aged ARMv6/ARM11 CPU, the Asha 311 – with its Gorilla Glass screen and an interface that’s been thoughtfully redesigned to mimic Symbian Belle – is a very smooth and pleasant handset to use. The UI reaction speed and fluidity of the kinetic scrolling is up with all but the very best handsets. Obviously, in terms of functionality, the Series 40-based Nokia OS is no match for a real smartphone operating systems. To start with there is absolutely no multi-tasking, so firing up any app involves the previous one shutting down which is pretty noticeable. And while the Facebook, Twitter, IM and email clients are all perfectly competent, I couldn’t recommend them over their Android equivalents running on something like a Huawei G300, which can be had for the same price, but on Pay As You Go rather than an unlocked vanilla device.